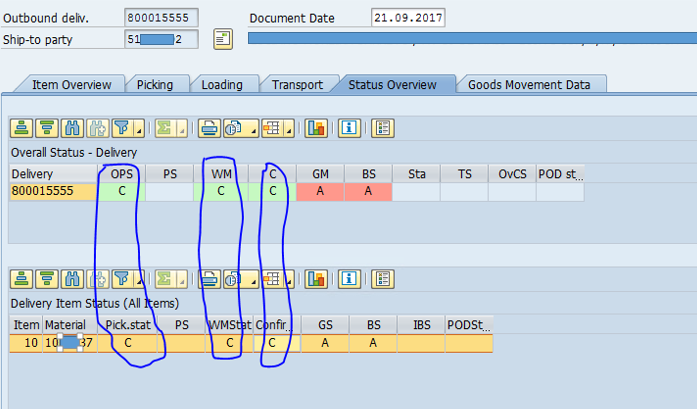 The main inspiration of writing this blog is to de-mystify batch determination process at transfer order level in warehouse management and how the TO batch updates delivery batch. A kind of Backward Batch Update. Most of the times user complain that batch split is (+) is not triggered in outbound delivery and some time Batch split(+) sub items are updated in delivery. This blog is written to understand the mechanism of how the batch split is updated in delivery through TO. 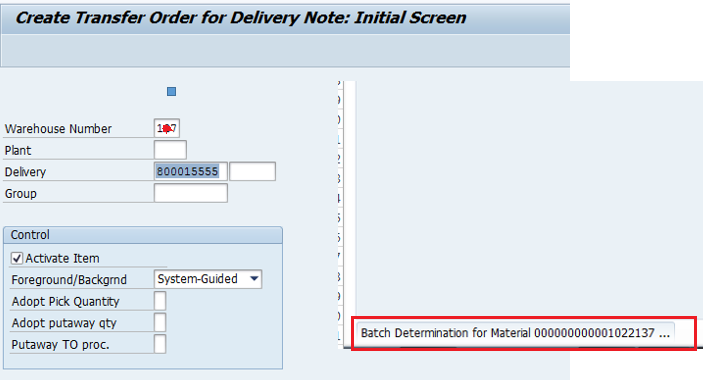 Batch determination at Transfer order level should be configured. 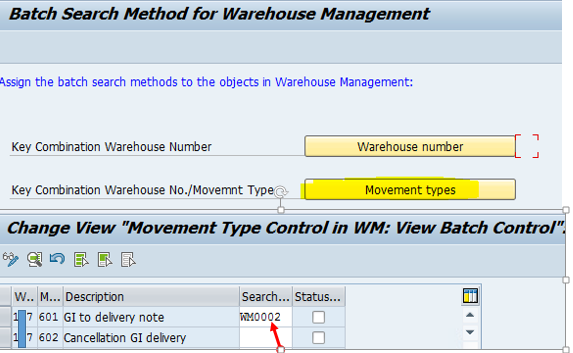 For WM, LS51 condition records needs to be maintained. Check the delivery how batch is updated. 2) OBD of 5 pcs is created with batch field as blank. You can observe that batch determination is triggered at TO level. This is because of batch determination is called at WM level. 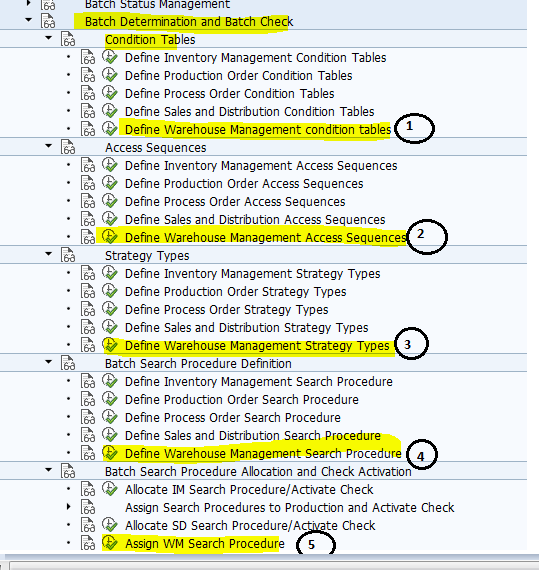 We will not see the Batch determination configuration here, only basic aspects as lot of documents are available on SCN on this topic. 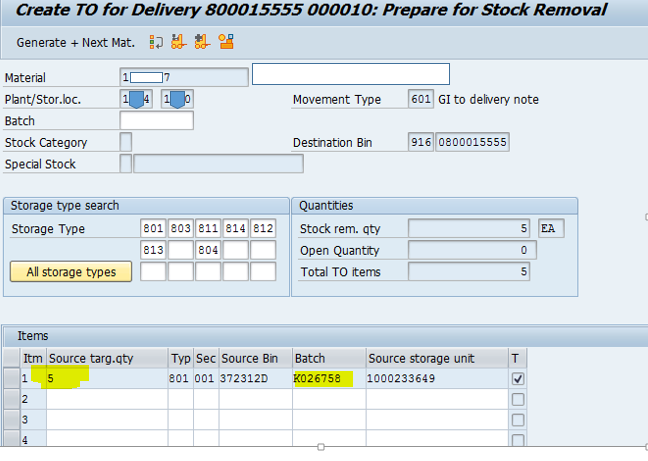 Lets check our Transfer order how batch is picked during batch determination. 5 pcs of batch is picked. 4) Lets confirm the Transfer order by LT12. 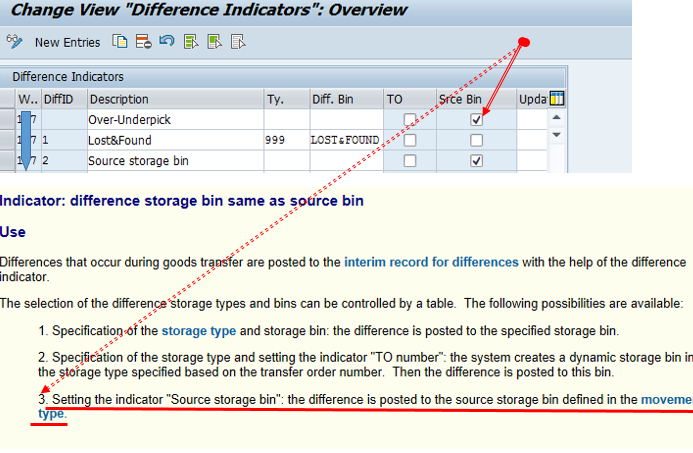 Confirm the TO with LT12 and same batch is copied in LT12 from LT03 which had been picked. Confirm TO with full qty. Save the TO. 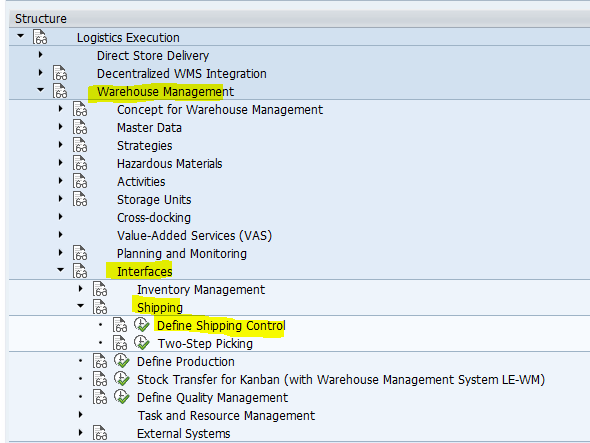 WM status are fully updated in delivery. 3) Create a TO LT03. 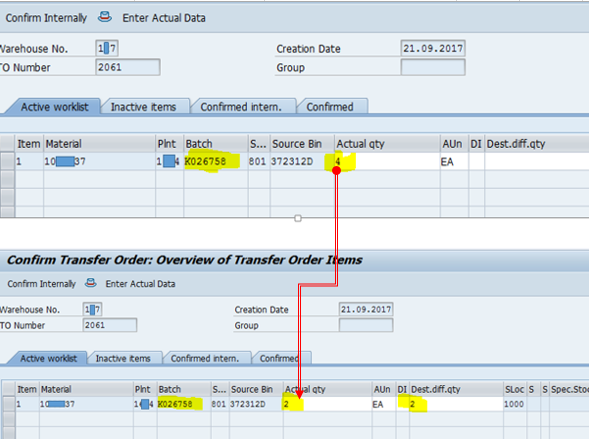 4) Confirm the transfer order with difference. Our delivery qty is 4, so I will confirm TO with 2 quantity. 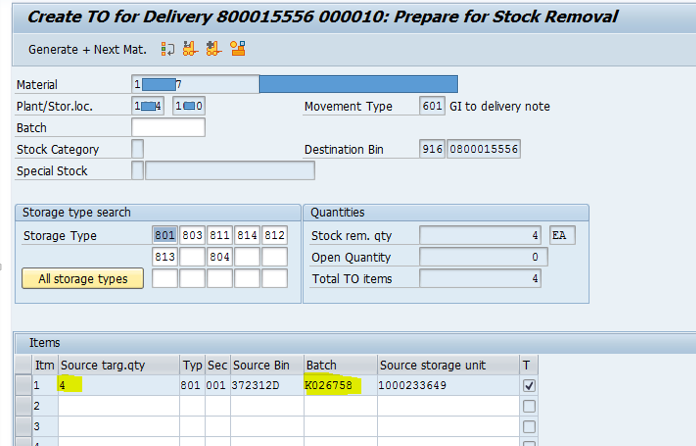 When we partially confirm the transfer order, the partial qty from WM should be transferred to delivery qty . This configuration talks about this. Now, confirm our TO with difference. It can be observed that against the obd qty of 4, 2 quantity is getting confirmed. Remaining 2 EA is sent to difference storage type 801. A customization is required to conduct these processes. 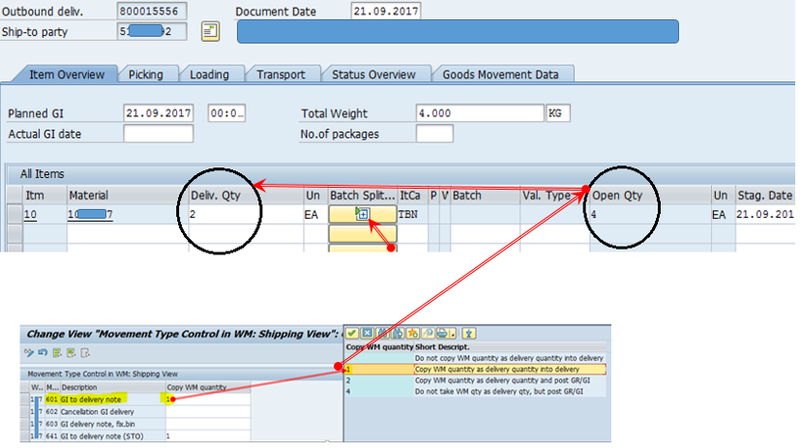 It can be observed that Batch split(+) is updated and delivery quantity is updated to 2 pcs from the below configuration. A batch split ( sub item) will occur only in delivery if the corresponding Transfer order confirmation has not been done of ‘’FULL QUANTITY’’. Batch split only occur in delivery if TO is confirmed partially. This is completely standard SAP behavior and changes to this process requires some user exit which is mentioned in SAP note 415716. Hence the blog ends here. I would wait for readers response if any correction is required. Very informative document covering different aspects of scenario. This will require some time to test. Our company A have 3 plant D100 D10A D10B, D100 is WM managed, D10A and D10B is IM managed. D100 D10A D10B have the same sales organization. The plant D100 same as scenario 1, Is it possbile to achieve D10A and D10B like Scenario 1(don’t have the + flag)? The problem is if i active the batch determination as below, it will affect D100. the DN of D100 will have the + flag. Great work. thanks for spending your valuable time in writing this blogs.. it is definitely useful those who love SAP.